The TelcoBridges Tmedia TMG7800 is our high density carrier-grade VoIP gateway and is defined by the highest scalability in the entire Tmedia family. Our scalable building blocks approach offers carriers a VoIP gateway from 16 to 1024 T1/E1, or 1 to 48 DS3, or 1 to 16 OC3/STM-1 per cluster. A single TMG7800 system can control up to 4 clusters creating a non-blocking switch for up to 131,072 channels. 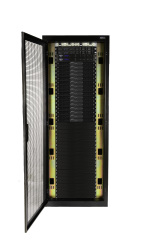 The TMG7800 also provides high availability and redundancy, which is a requirement for carrier-grade networks. Call routing based on: trunk group, calling/called numbers (with digit manipulation) and/or various other protocol information/headers. Customizable routing including priority-based, loadbalancing, black listing, call limiting, route retries, etc.